It was recently brought to my attention that I have as yet to post a dessert recipe. Quel faux pas! What a mistake! Last year, I was given a chocolate cook book and am becoming a legend with my chocolate desserts. Death by Mississippi Mud pie should actually be the title of one of my posts. One slice and your mind is in chocolate heaven and your tummy is in serious danger of explosion. A sheer joy is what it is. 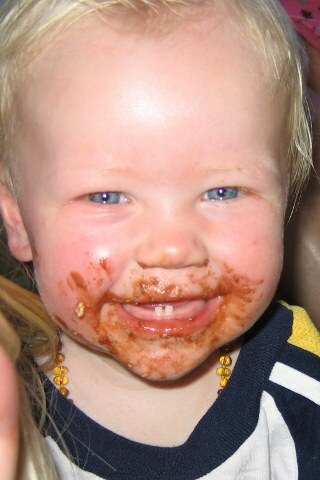 Today you are meeting Louis, my biggest chocolate fan. Don’t those two teeth and that gorgeous big smile say it all? 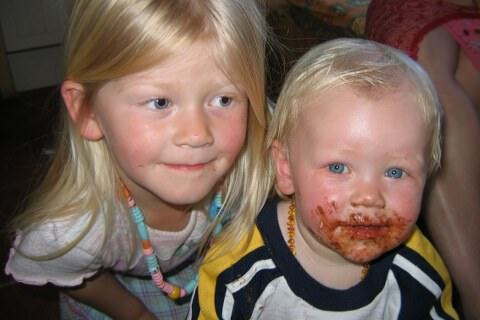 His beautiful big sister, Emma, and he are both big chocoholics, but Louis does take the (chocolate) cake in this department, if you’ll pardon the pun. Such lovely children generally also have lovely parents and Marieke and Leon are no exception here. They were both well-known ballet dancers with the Dutch National Ballet and Marieke was even a Prima Ballerina (meaning she danced alone on stage) and people recognize her on the street. My motto is if you can’t be famous then you should at least have famous friends! I have a beautiful German saying that would fit here perfectly, but you just can’t translate sayings directly from one language to another. But I’m going to anyway (how did you know that was coming??). They moved into our area a few years ago and (the gorgeous) Marieke has started a ballet school in Simorre, a beautiful village not far from where we live. You’ll hear more about Simorre in a different post. In fact, she is having a “Spectacle” (love that French language again!) or Annual Show on June 13th at 8.30pm, where her pupils will be showing off all they have learnt in the past year. We went to one she did 2 years ago and it was SUPERB, even for non-ballet enthusiasts. The choreography was done to Spanish music and it was very exciting and fun to watch. I thought I had a photo to post here, but they are not my best effort, so you will have to go onto her website http://petitpas.danse.free.fr (there is NO www.) to have a look. But hey, come back here once you’ve had a look!! Her husband, Leon, has retrained as a builder/carpenter and is always the best looking guy on a job site. He’s one of those guys where you wish he had a Builders Bum problem, if you know what I mean. Just in case you don’t………..this concept was introduced to me by another friends son, Murray (you’ll meet him later too), who explained to me that this is the technical term for the unsightly rear end view of a builder at work, i.e., when his pants are down further than a lady would like to see. Now how do I get from this image to my chocolate recipe? Not easily is all I can say. 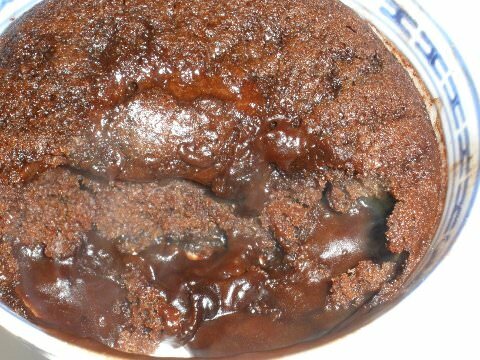 What I have been making a lot of lately are the self-saucing puddings or molten puddings, where the top is cake-like and the bottom is a liquid chocolate sauce. To die for. I have several recipes for this, some which you cook in a water bath and others not. Today, I am posting one that does not need a water bath. Do NOT leave the pudding in the oven for too long as otherwise you will not have any sauce in the bottom. I have done this and the cake is still very nice but has no sauce and it is definitely better with sauce. 1. Preheat the oven to 180C / 350F. Lightly grease 8 ramekins that are at least a 125ml (1/2 cup) measure. Sift the flour, baking powder and cocoa together and then add the sugar before mixing in the eggs, milk and butter. Mix thoroughly and then pour into the prepared ramekins. 2. ON TOP: Combine the sugar and cocoa and sprinkle over the batter. Place the ramekins onto a baking tray and then carefully pour ¼ cup / 60ml of boiling water over each pudding. Do this gently. To aid even coverage, you can pour the water over the back of a metal spoon. 3. Bake the puddings for about 15 minutes, and no more than 20 minutes if your oven is a little slow. Remember, if you leave them in for too long, you won’t have any sauce on the bottom! To check if the cake is ready, you can insert a skewer to about halfway and see if it comes out clean. Serve with cream or ice-cream and enjoy! Submitted by climatechange2007.org (not verified) on Fri, 21/06/2013 - 05:49.
up being quite enjoyable and useful! Within todays world that’s very hard to achieve.